At the end of this month, Wetherbrooke Farm will be hosting a 2 day clinic in preparation for the 2011 show season. The clinic will be conducted by Joy Von Handorf , an ICP level 1 Training Instructor. Joy has been certified by the United States Eventing Association to teach riders up through Training Level in eventing. She is one of only a handful of instructors in the state of Ohio who have been certified nationally to teach the sport of eventing. Joy currently rides at the Preliminary Level on her horse Augustus, and will also be competing her new horse, Rhyland, at the Beginner Novice Level in May. Joy has trained with oympic gold medalist, Leslie Law, ICP level 4 instructor, Robin Walker, and Grand Prix dressage trainer/rider, Sue Black. Joy spent the last month in Ocala, Florida training with 2 time Olympian and WEG silver medalist, Dorothy Crowell. 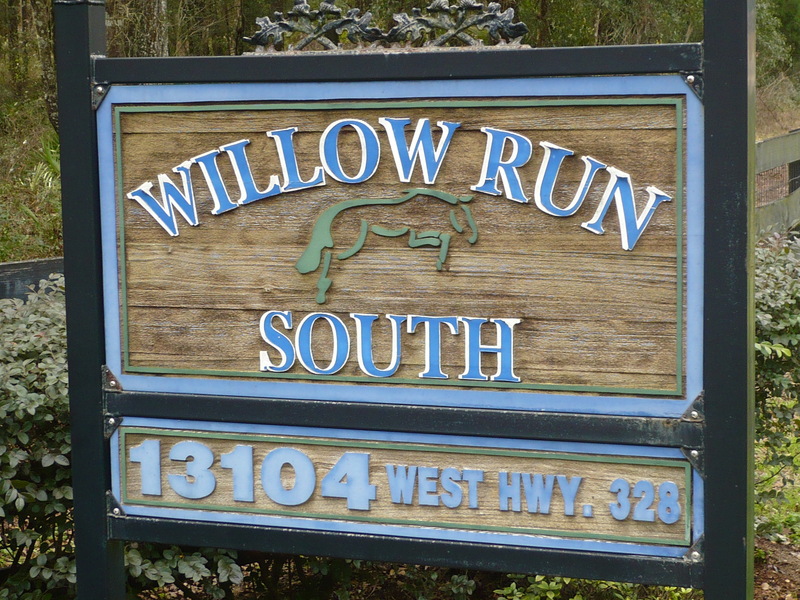 All outside horses must send in a current coggins with entry form. 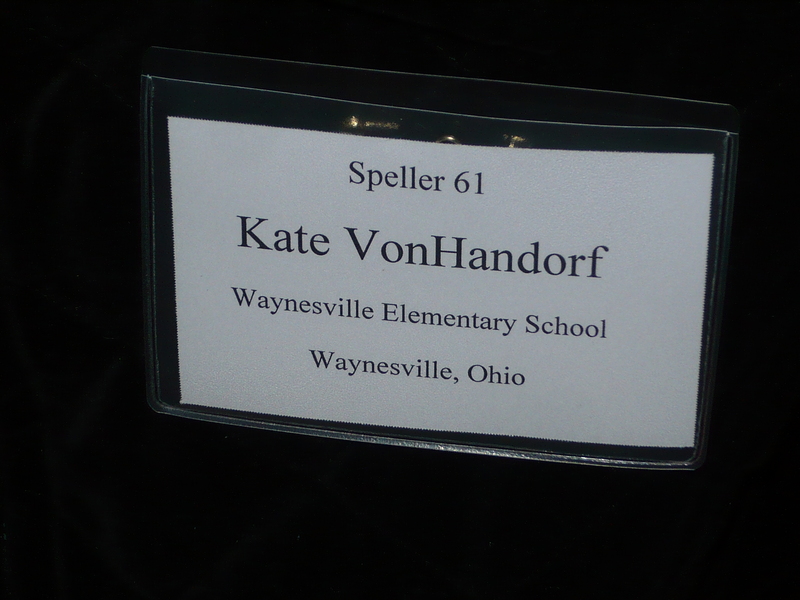 We call Kate “the spelling bee” because Wade thinks she “is” the spelling bee. I’m not exactly sure what he pictures when he calls her that, but I am pretty sure it involves yellow, black, and a pair of wings. On Saturday she competed in the regional finals in Cincinnati. The winner of this one would go on to the National Spelling Bee in Washington DC. Kate was fantastic! 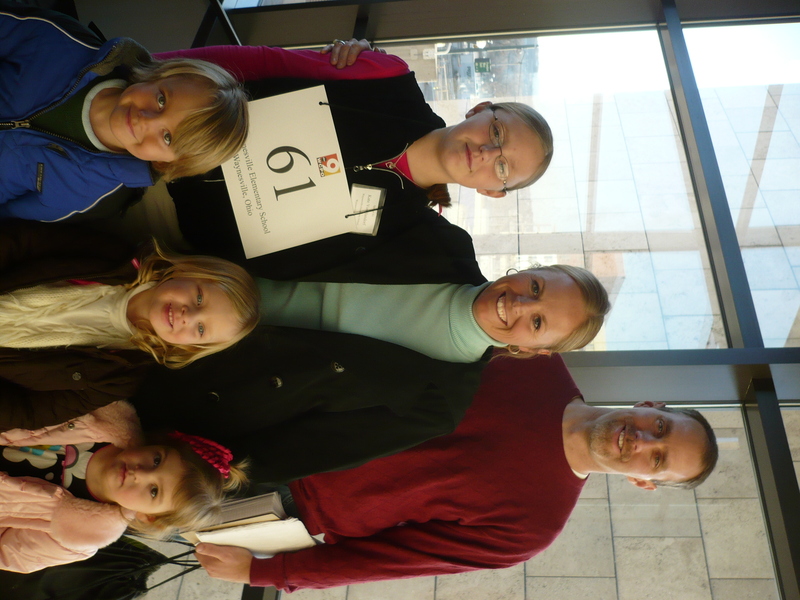 She ended up finishing 5th out of 67 spellers from 4th-8th grade. We are so proud of her! That will be the last spelling bee she is able to compete in, but she will always be “our spelling bee”. Well, where do I begin??? My last entry was written right before my final show of the trip. Yes….I said final show of the trip. I am home now. It all began on Sunday, a week and one day before Valentine’s Day. Jeff and the kids were struggling at home in the cold and ice that week. Our furnace was out for 4 days. The furnace men couldn’t get up on our metal roof to fix the chimney until the ice melted. He and the kids lived at my in-laws’ house until they turned the furnace back on. When it finally got fixed, the house got flooded with soot. The ice and wind storm also tore down the power line in our front yard. Jeff got some really stressful news about his business. Things were not going well on the homefront. I had had a really bad lesson with Gus that Sunday. That Monday I had a great dressage ride, but decided that there was no way I would reach my goals with Gus in time to move him up to preliminary at Rocking Horse 2. We had lost nearly a week of training with the whole Banamine reaction fiasco, and things didn’t seem to be coming together in time for me and Gus. It was on that day….one week before Valentine’s Day….that I planned my surprise. Gus and I trained really well from that day on. We made huge strides, but Dorothy knew that I was planning to leave after the Ocala show. She told me that Gus and I had done more in the 3 weeks that we had been taking lessons than most people do in whole summers at her farm. She was really excited about the progress we had made. She even went so far as to tell me that if I had money, there would be no reason why Gus and I wouldn’t be able to do intermediate or higher. She even made it sound as if she thought maybe we could have made it to intermediate if I had been able to stay the season (until April). IF….. 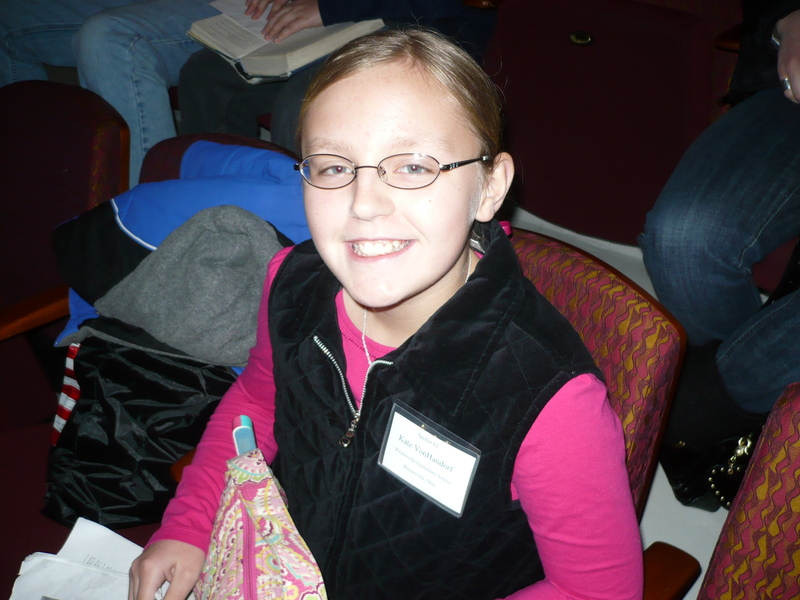 But I had already decided that nothing could keep me from seeing Kate in the spelling bee. I missed it last year, and I wasn’t going to do it again. I spent the day packing on Thursday. By the time I left for the show on Friday, all that was left were the water buckets and feed pans in Gus’s stall. We arrived at the show on Friday and put in a fantastic dressage test in front of a true dressage judge ( who is also a grand prix dressage rider). We placed 2nd with a 36.4. We were just barely out of 1st. On Saturday, I rode x-c at about 9am. Once again, we had a great warm-up. I was sitting in 2nd, so I was very careful with my course walks and wheeled the course to make sure I knew my half-way mark for time. I rode my course according to plan. Gus was absolutely perfect. We were fast when we could be fast, and technically correct when things got tricky. He did everything right. It was the best cross- country course I have ridden to date, and we did it in our dressage bit. We were double clear, and it moved us into first place. For those of you that know about eventing, there is no scarier place in the world to be than sitting in 1st place going into stadium. I was sitting in 1st by a thread. The top 6 riders were all within a few points of each other. I had to go fast and clean in the stadium. Gus jumped really well in my warm-up, but there were still moments where he would fall back into old habits and want me to hold him up over the fence. With that being said……at fence number one he laid on my hands and wanted me to hold him up to the fence. I chucked my reins forward and told him to carry himself. It was exactly what I was supposed to do, but Dorothy said I got a little ahead of him when I did it, and he bumped the rail with his back legs. I heard it fall, and I knew that I had just lost my $200 prize money and my first place ribbon. Though it made me sick inside, I refused to throw it away. I rode really well the rest of the course, and I ended up having a nearly perfect last 4 fences. It dropped me into 6th place. Dorothy was really happy with the ride. She told me that she was sorry I lost my first place, but that she was really proud of the fact that I rode the course how I was supposed to, and that it got better as it went. I was still sick over it, and I wondered if I would think about that rail for my entire drive to Ohio. (I did, by the way). Michelle and Pickles had a great weekend. She went from 10th place after dressage, to 8th place after stadium, to 3rd place after x-c. Dorothy also had a great weekend. I think her ribbons ranged from 2nd to 8th on her 4 horses. I went to sleep all afternoon in order to get up at 2am to make the long trip home. The kids and Jeff knew nothing about it. My family, Jeff’s parents, and a few of my girls at home knew I was coming. Jessica had Gus’s stall ready for us, and I tormented Jeff on the phone all day long while I drove. I made up a crazy story about a delivery being made between 6 and 7 pm that needed his signature. It was a Valentine’s Day surprise for him and the kids. He had absolutely no clue. I laughed all day long as I talked about “the man” who was going to make the delivery. He didn’t even ask questions. Hysterical. I showed up with my trailer, and it was an exciting reunion. I was so glad to see all of their faces! We went to Flying Pizza for dinner, where I had called ahead to have them put the pepperoni in the shape of a heart (corny, I know!). Then I crashed. The next 3 days were spent cleaning soot out of my house…………. Things I will leave with….. I will be leaving Ocala this winter with some very important lessons learned. Not riding lessons, but life lessons. Though the riding has been great, I have been reminded of things far more important. I have always loved my life. I could not have planned it out to be any better than this. Even though I am an over achiever that always feels driven to move up a level, build more stalls, buy and train a new horse…. I realize that even if I lost everything, my world would be just fine. You see, I have the greatest family in the world. My husband is not only handsome (and you all know that he will kill me later for writing that! ), but he is the best husband and father that ever lived. He has supported these crazy horse dreams of mine for all of these years, and I am so thrilled that he is finally able to pursue his own. And then there are my kids….I don’t have words to describe how blessed I am to be their mom. They are the smartest, funniest, sweetest, and cutest kids ever born (maybe I am a bit biased, but I don’t think so). So that is that. This may be my last entry. All that’s left to do now is ride. 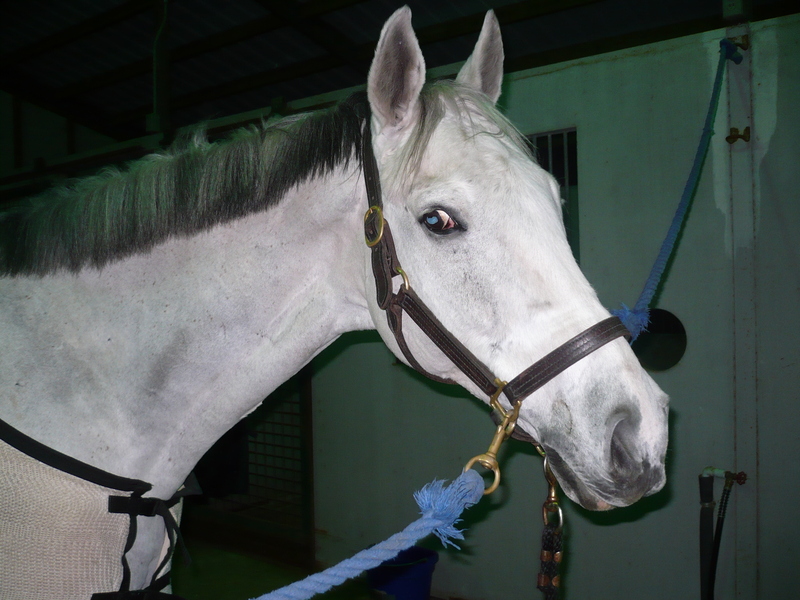 This weekend’s horse show will be held over 3 days. Gus and I will be doing our dressage test at 8:19am. I think our x-c is at 8:48am on Saturday, and Stadium is about 8:00am also. It will be early to bed and early to rise for me and Gus this weekend. You all know how I am going to LOOOOOVVVVVEEEE that . I plan on having all of my tack cleaned and packed today, and Gus will get braided last thing before I leave tonight. Yesterday was dressage day. Gus was great. Dorothy is happy with how well he going, and I am really happy about how quiet he has been. I am looking forward to testing the torture circle out in a new environment tomorrow. The show will be held at the Florida Horse Park, and I am hoping to keep him as quiet (but with more energy) in our dressage test. Today is supposed to be a jumping day. I really hope that the rain stops so that I can have a lesson. I am in one of those weird places in my riding where I am “between” styles. I know that a few fences at the CANTER will make that awkwardness go away. Let’s hope she lets me canter them today! On Sunday we had our REALLY bad jumping (well, sort of) lesson. Needless to say, it was a day that I decided to put Gus up for sale. I am not sure if he is really for sale or not, but he may be??? I know you all have heard that one before. On Monday (yesterday) I had a fabulous dressage ride. It had been raining sideways all day long, but at about 5pm it cleared up. Gus and I were the only ones out riding at the Hollings. It was as if he had heard me say the words “for sale” because he was perfect. I even worked on the sitting trot for the first time since I have been here. It was actually good. All of the work I have done down here “moving in the saddle” has dramatically helped the sitting trot also. I ended the ride with a hint of doubt in my mind whether or not Gus was going to be for sale. Sometimes I make myself really tired with the wishy washiness. I guess it’s because deep down I really, really, like him and want him to work. Today was perhaps the craziest riding day I have ever had. Dorothy was making me walk fences again. Not just little ones, but I swear that some of them were training level height. I nearly fell off about 20 times, lost my stirrups at least 10 times, and was out of the tack so high over one jump that the rip cord on my blow up vest was getting pulled. I have to be at least 18 inches out of my tack for my air vest to blow up. I could feel the cord pulling and thought I was in for it. Somehow I managed to fall back in to the saddle as Gus kept running in a straight line. Dorothy laughed like a hyena and said that Gus’s legs were above the standards. I thought to myself…Funny,very funny….. She then proceeded to make me walk the oxer again and again and again. I only wish that I had someone videotaping the whole thing. You tube would have loved me. After the lovely “walk, trot, pop” lesson over stadium fences, I got to go out and try my luck over some cross- country fences. Some of the fences were spectacular. Some of the fences were spectacular in a “not so pretty” kind of way. Not only were we not allowed to “canter” the training level fences with “prelimary” questions, but we had to jump them from a trot on a “LOOPY” rein. More stirrup loss, more near death experiences, more laughing from the sidelines. At one point I felt every vertebrae in my back snapping. Gus ended up with a cut on his leg, and I am so sore that I may not be able to get out of bed tomorrow. It’s a good thing I went for a run this morning, because there is no way on earth that this body will be able to run tomorrow. I will be lucky enough to roll off of my air mattress in the morning and pick myself off of my floor. The amazing thing is this…..after nearly falling off about 30 times (although Dorothy claimed that if I stayed on over the oxer that almost exploded my vest, I wasn’t going to come off—–comforting) I have a strange confidence about jumping. 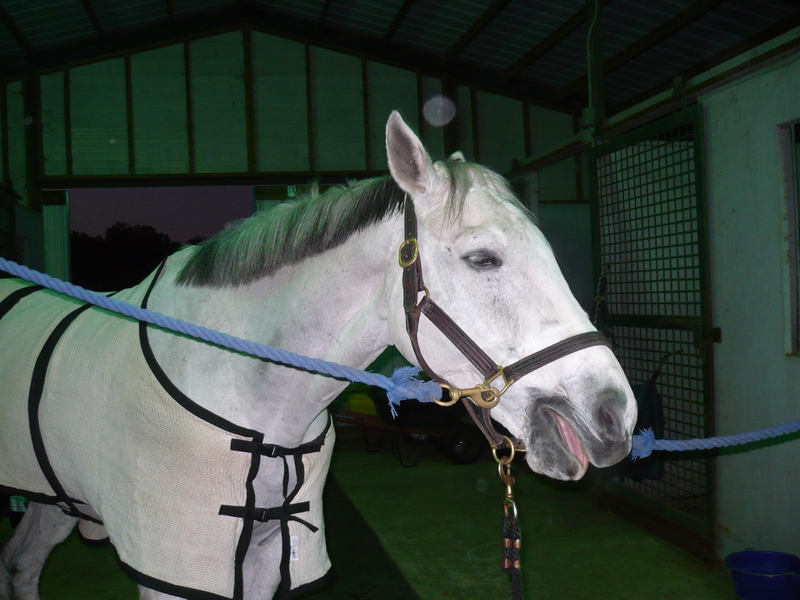 My horse can jump really big fences at a walk……I did not die…….Cantering will feel REALLY good. I just hope I am able to walk tomorrow. Tomorrow is “dressage” day. Thursday is stadium day. Friday is my dressage test at the Florida Horse Park. I feel like singing , “hang on Slewpy Dewpy, hang on”. I wish I could tell you that the lesson following this picture taking session was a good one, but that would be a complete lie. Gus was wayyyyyy too excited to get back to the jumping after his week of medication, relaxing, and hacking. 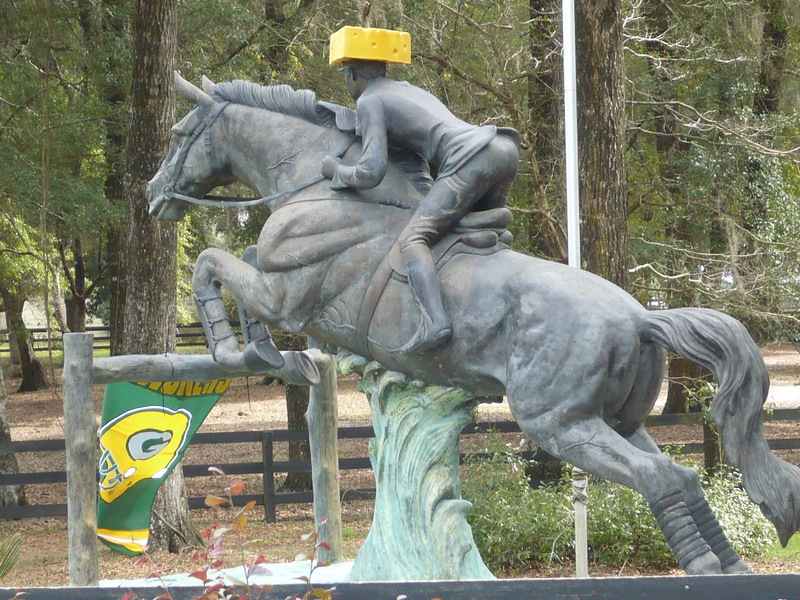 The horse was just plain wound up. I was all ready (blow up vest and all) to do some x-c jumping today after a short stadium lesson. Yeah, right. Gus had other plans. My plans were to quietly proceed from the gymnastic part of the lesson to the course work part of the lesson, and then end up rolling around the x-c course. 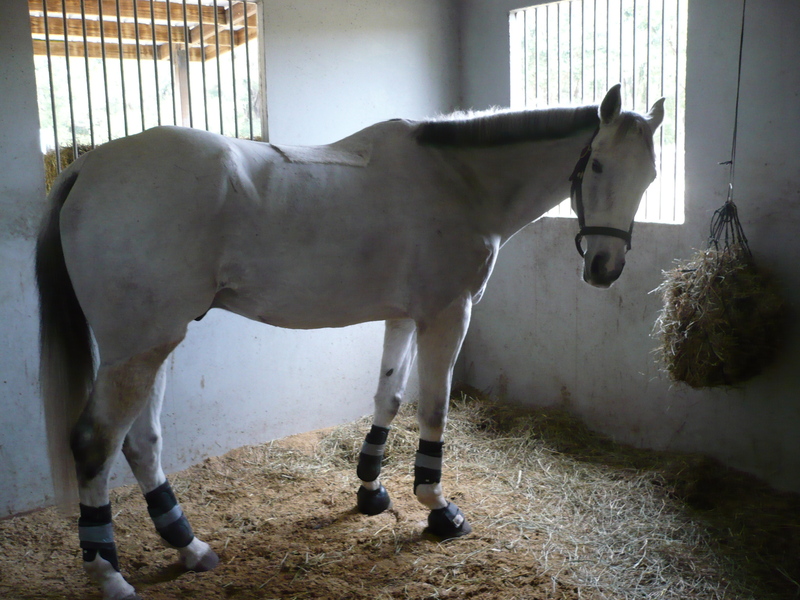 Gus had this plan…….canter as fast as you can over the ground poles, then blast your way through the gymnastic, then get in trouble, and lastly spend the next hour walking over BN height fences for the rest of the lesson. 2 hours later……he was still hyper and I was exhausted. I never did see a x-c fence, but the horse can jump like no one’s business—–even at the walk. Today I drove to the little corner grocery to get a snickers bar. Yes….I desperately needed chocolate before my lesson. As I passed Jon and Jen Holling’s driveway, this is what I saw. I had to stop my car and get out to take a picture. 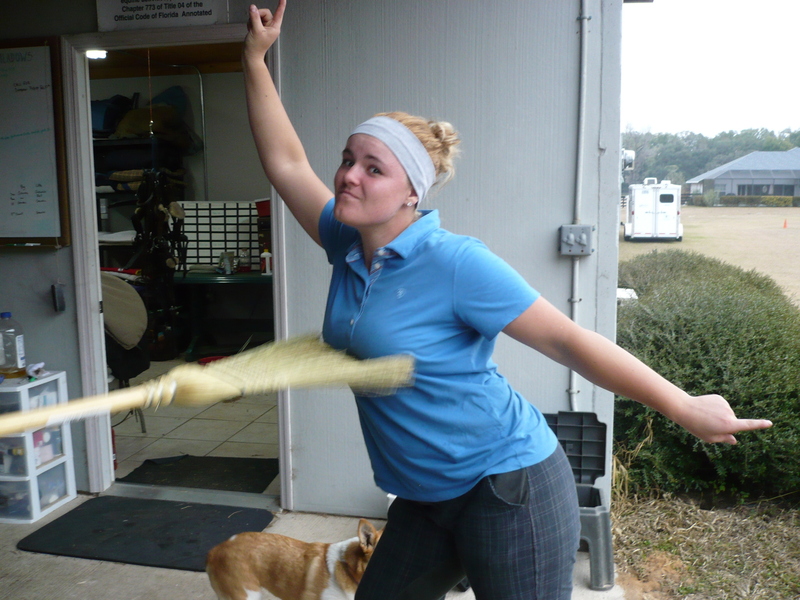 Michelle might need a "bigger broom"
Autumn Schweiss—who needs a push-up bra when you have a barn broom? You all have no idea what I am dealing with down here. I am surrounded by teenagers and people in their early twenties. Yesterday Michelle decided to make coffee at the barn. It smelled delicious, but by the time the girls had drunk their second or third pot of coffee they were crazy. 8am karoake in a barn is not good. They were using the broom as a microphone (and for other things that were captured in the pictures) while the music filled the barn. Dorothy Henry (the owner of the farm) probably could hear them singing all the way up at her house. The dogs hid. The horses spun in their stalls. I sat in amazement at how early in the morning things could go so wrong. 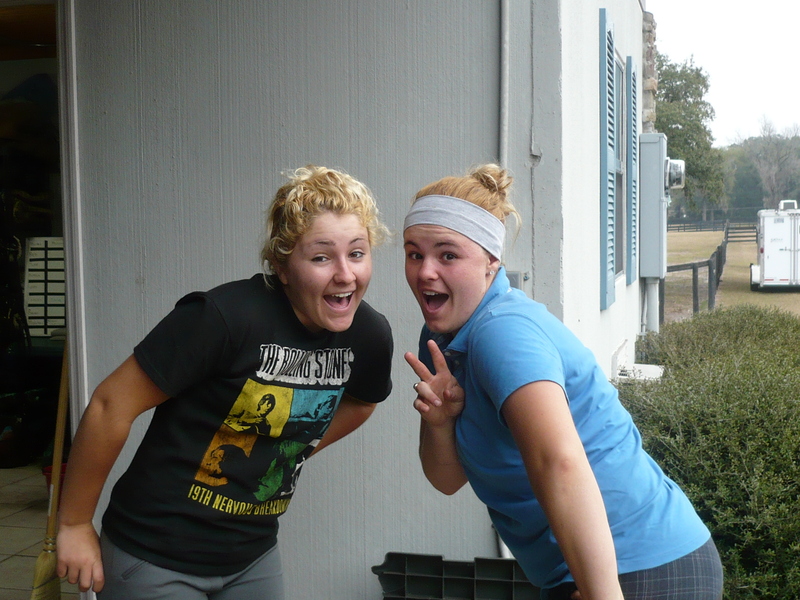 The Schweiss sisters (Autumn and Lark from Minnesota) got pulled into the craziness also. Girls hopped up on caffeine…….singing club tunes……8 o’clock in the morning……wow. Yesterday I found out that Kate passed her on-line spelling bee test. That means that she will once again compete in the Scripps Regional Spelling Bee at the Harriet Tubman Center in Cincinnati on February 19th. Not only did she pass the on-line test, but she spelled 47 out of 50 words correctly. I was sooooooooooooo excited to hear her little voice on the phone as she passed on the great news. Last year as a fourth grader (competing against 4th -8th graders) she came in 7th out of 75 students. 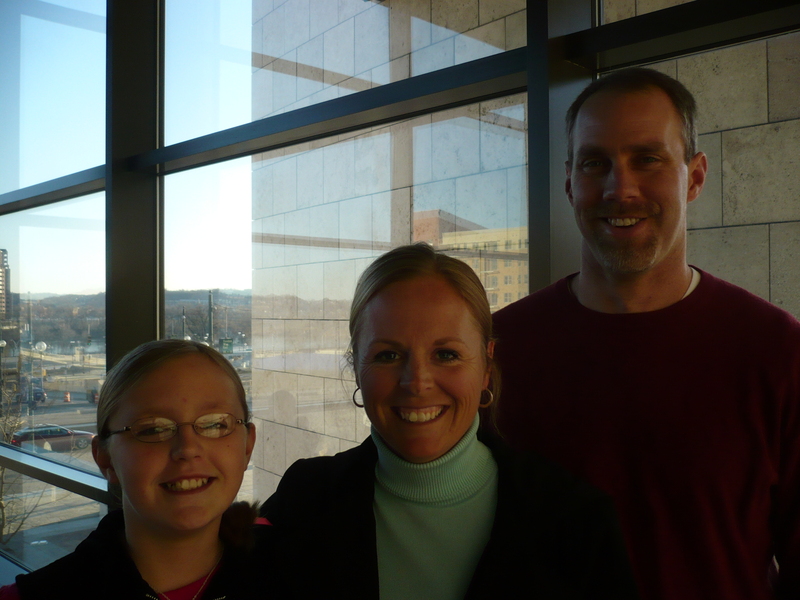 The winner of the regional spelling be will compete in the national spelling bee in Washington DC later this spring. GO KATE!!!! I also found out today that she scored her first basket at her basketball game this morning. I wish I could have been there to see it. I was so proud of her. It made me think of my dad…..he would have been thrilled. wetherbrookefarm on Rocking Horse Horse Trials……. wetherbrookefarm on Random pictures from the show…..
wetherbrookefarm on THE WAIT IS FINALLY OVER!!!! Merry Christmas, Kate!!!!! Tammy on THE WAIT IS FINALLY OVER!!!! Merry Christmas, Kate!!!!! A great weekend at the Kentucky Horse Park!